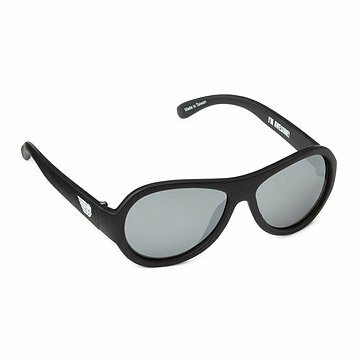 These durable, pint-sized aviator sunglasses will protect your child's eyes from harmful UV rays. It was a bright, sunny morning when an F-18 fighter pilot for the US Marine Corps, waiting on the flight line for take-off, looked out at the assembled crowd of military families and noticed something. While the adults were all wearing protective sunglasses, their children were not and had to squint in the morning sun. It turns out that children's eyes need even more protection than adults', but that kids' sunglasses often proved too easy to break. Working with his wife and friends, this pilot developed a line of super-cool aviator glasses for children. Babiators’ sunglasses are made out of durable and flexible rubber frames, so they'll hang tough through all kinds of playtime adventures. Their impact and shatter-resistant lenses block both UVA and UVB rays to protect your child's sensitive eyes. Babiators are also the only children’s sunglasses to offer a Lost & Found Guarantee: if a child’s Babiators are lost or broken within one year of purchase, Babiators replaces them…Guaranteed! Made in Taiwan. Junior Babiatorstm: 6 months - 3 yrs. Classic Babiators: 3 yrs. - 7+ yrs. To clean lenses, wash with soap and water and dry with a soft cloth. Classic Babiators (Ages 3 yrs - 7 yrs): Eyepiece: 11.5 cm Wide; Lens Height: 4.5 cm; Lens Diagonal: 4.75 cm; Total Arm Length: 10.5 cm. Best new baby gift ever! As we all want to do the best for babies, this product offers eye protection from Day 1. I love giving this as a new baby gift. Purchased two sizes of Babiators as a baby shower gift for my daughter. Glad my grand baby's eyes will be protected. These are very durable for a baby to wear, adorable style! One of the best new baby gifts. It marks a practical and useful new baby gift. It protects their precious eyes. Awesome product for little ones. Babiators are stylish as well as protective for babies eye health.